Flaying is the removal of skin from the body. Generally, an attempt is made to keep the removed portion of skin intact. An animal may be flayed in preparation for human consumption, or for its hide or fur; this is more commonly called skinning. Flaying of humans is used as a method of torture or execution, depending on how much of the skin is removed. This article deals with flaying in the sense of torture and execution. This is often referred to as "flaying alive". There are also records of people flayed after death, generally as a means of debasing the corpse of a prominent enemy or criminal, sometimes related to religious beliefs (e.g. to deny an afterlife); sometimes the skin is used, again for deterrence, magical uses, etc. (i.e. scalping). Flaying is an ancient practice. There are accounts of Assyrians flaying a captured enemy or rebellious ruler and nailing the flayed skin to the wall of his city, as a warning to all who would defy their power. The Aztecs of Mexico flayed victims of ritual human sacrifice, generally after death. Searing or cutting the flesh from the body was sometimes used as part of the public execution of traitors in medieval Europe. A similar mode of execution was used as late as the early 1700s in France; one such episode is graphically recounted in the opening chapter of Michel Foucault's Discipline and Punish (1979). In medieval Britain the invasion of the sanctity of the church was classed as sacrilege and the original punishment was to be flayed alive . The Subprior and the Sacrist of Westminster Abbey broke into the Chapel of the Pyx in 1303, the abbey muniment and treasury chamber, and stole from the contents. The Pyx chapel door has been found to have fragments of human skin attached to it as have the three doors to the revestry. Copford church in Essex, England has been found to have human skin attached. In China, a variant form of flaying known as death by a thousand cuts was practiced as late as 1905. Yahu-Bihdi, ruler of Hamath , was flayed alive by the Assyrians under Sargon II. According to Herodotus, Sisamnes, a corrupt judge under Cambyses II of Persia, was flayed alive for accepting a bribe. In Greek mythology, Marsyas, a satyr, was flayed alive for daring to challenge Apollo. Also according to Greek mythology, Aloeus is said to have had his wife flayed alive. 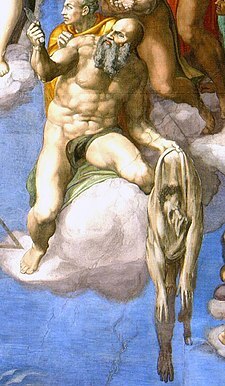 Tradition holds that Saint Bartholomew was flayed before being crucified. In Aztec mythology, Xipe Totec is the flayed god of death and rebirth. Slaves were flayed annually as sacrifices to him. The Talmud discusses how Rabbi Akiva was flayed by the Romans for the public teaching of Torah. In 260 Roman Emperor Valerian was taken prisoner by Persians. Some accounts hold that he was flayed alive and his skin turned into a footstool. In 415, the Neo-Platonist philosopher Hypatia of Alexandria was flayed alive. Mani, founding prophet of Manichaeism, was said to have been flayed or beheaded (c. 275). Totila is said to have ordered the bishop of Perugia , Herculanus, to be flayed when he captured that city in 549. Pierre Basile was flayed alive and all defenders of the chateau hanged on 6 April 1199, by order of the mercenary leader Mercadier, for shooting and killing King Richard I of England with a crossbow at the siege of Chalus in March 1199. In 1314, the brothers d'Aulnoy, who were lovers to the daughters-in-law of king Philip IV of France, were flayed alive, then castrated and beheaded; and their bodies were exposed on a gibbet. The extreme severity of their punishment was due to the lèse majesté nature of the crime. The Polish Jesuit Saint Andrew Bobola was burned, half strangled, partly flayed alive and killed by a sabre stroke by Cossacks on the schismatic side. In a particularly acute example of deadpan, Jonathan Swift's narrator in "A Tale of a Tub" says, "Last week I saw a woman flay’d, and you will hardly believe how much it alter'd her person for the worse". One of the plastinated exhibits in Body Worlds includes an entire posthumously flayed skin, and many of the other exhibits have had their skin removed. In 991 AD during a Viking raid in England, a Danish Viking was flayed by London locals for ransacking a church. Daskalogiannis, a Cretan rebel against the Ottoman Empire was said to have been flayed alive. The Rawhide Valley in Wyoming is said to have gotten its name from a white settler who was flayed alive there for murdering an Indian woman. Marco Antonio Bragadino was flayed during the Conquest of Famagusta (Cyprus) by the Turks. In 1944, a three-year-old Serb boy, Tomislav Vucetic, was allegedly skinned alive by pro-Axis Kosovar militiamen. In 2000, government troops in Myanmar reportedly flayed all the male inhabitants of a Karenni village. In 1404 or 1417, the Hurufi Imad ud-Din Nesîmî, an Islamic poet of Turkic extraction, was flayed alive, apparently on orders of a Timurid governor, and for heresy. In the United States, Nat Turner was hanged on November 11, 1831. His body was then flayed, beheaded and quartered. Billy Lynch, a U.S. Marine from the Boston area, was captured by the Japanese during WW II. His "captors tortured him, peeling the skin from his body before killing him, cutting him up, and stuffing his remains in a barrel that was sealed." Wall, J. Charles (1912), Porches and Fonts. Pub. Wells Gardner and Darton, London. P. 41 - 42. 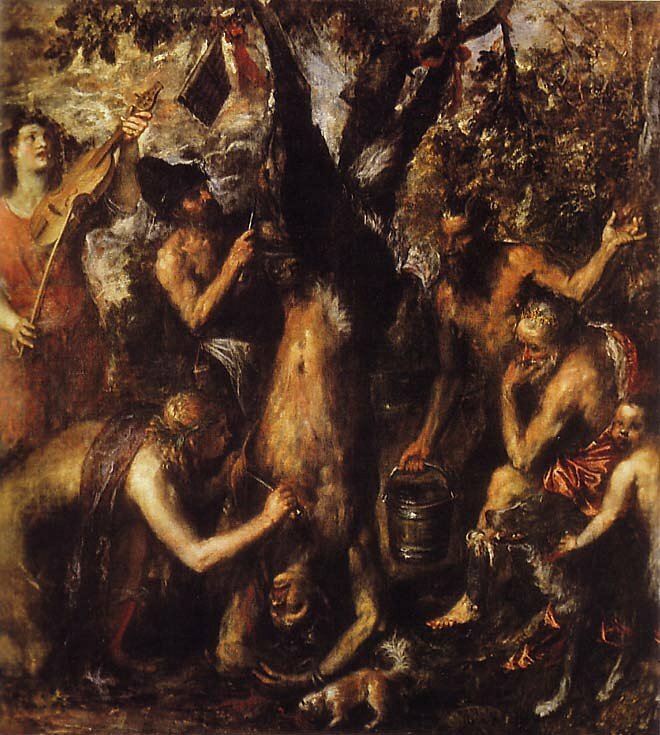 1575 Painting: The Flaying of Marsyas, by Titian.